1. Tea is often labeled TGFOP. What do the letters stand for ? 2. Which singer has the nickname 'toxic twin' ? 4. When does one drink 'storage' ? 5. Granny, Turks Head, Quipa, Dutch Cringle, Nubian and Flemish Flake are all examples of what ? 6. Name the five persons who have won the Grand Slam in tennis. 8. Captain Robert FitzRoy (1805-1865), Commander of the H.M.S. Beagle, first coined which risky meteorological term ? 9. John Entwistle of The Who drew which 'incomplete' album cover for the band ? 10. The following are main characters in which book or film ? 2. Steven Tyler (or Joe Perry) of Aerosmith Steven Tyler is known for his musical interplay with the other members of Aerosmith, particularly with guitarist Joe Perry. In the 1970s, the two were known as the "Toxic Twins", so-called for their legendary substance abuse. They are still referred to collectively as that name, despite being drug-free for over 20 years. The two will often perform very close together side-by-side, particularly when Perry sings backup or adds vocal harmony, or during sit-down acoustic performances. 4. When one drinks lager. Lager means storage or to store.. Lager is a type of beer which was first brewed in Central Europe 500 years ago, and has since become one of the most popular types of beer in the world. The word "lager" comes from German and means "storage". Traditionally, the beer is stored for several weeks or longer before being served. Lager is a general term that includes several variations or styles, such as Pilsener, Vienna, and M?rzen. 8. Forecasting the weather or weather forecast Vice-Admiral Robert FitzRoy (5 July 1805 ? 30 April 1865) achieved lasting fame as the captain of HMS Beagle during Charles Darwin's famous voyage, and as a pioneering meteorologist who made accurate weather forecasting a reality. He was an able surveyor and hydrographer and served as Governor of New Zealand from 1843 to 1845. The British Isles weather forecasting sea area Finisterre was renamed FitzRoy in 2002. 9. 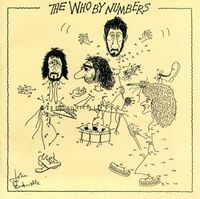 The Who by numbers The Who By Numbers is the seventh album by the English rock band The Who, released in 1975. It was named the tenth best album of the year in The Village Voice Pazz & Jop critics poll. The cover was drawn by John Entwistle as he was drawing a cartoon history of The Who. The Who By Numbers peaked at the number 7 position on the UK album chart and number 8 on the Billboard 200 album chart in the United States.